Public for Penn Station, a new commuter advocacy campaign, launched today to demand a comprehensive, long-term plan to finally fix Penn Station. With construction underway on Moynihan Train Hall and East Side Access and the expiration of the operating permit for Madison Square Garden in 2023, there’s a once-in-a-generation opportunity to fix the many problems plaguing commuters at Penn Station while ridership is temporarily lower than it is today. Penn Station was designed to serve 200,000 passengers. Today over 650,000 passengers use the station daily, drastically exceeding its capacity, leading to dangerous conditions including mass overcrowding. Low ceilings, poor wayfinding and jam-packed entry and exit ways make Penn Station difficult to traverse and present serious egress obstacles in the event of an emergency. Penn Station entrance. Photo: Wikimedia Commons, NHRHS2010. THERE ARE COST-EFFECTIVE, FEASIBLE IDEAS THAT WOULD DRASTICALLY IMPROVE THE EXPERIENCE FOR COMMUTERS. Many ideas have been proposed by transit advocates, government entities, architects, planners, designers and others that would completely reshape Penn Station. There are several key elements that these proposals all share, including eventually moving Madison Square Garden to a new location. This would allow for opening up the facility to more natural light and air. All of the proposals also dramatically improve the passenger experience, wayfinding and safety. They vastly expand the size and number of entry and exit ways that will make it easier for passengers to exit in the direction closest to their final destination. Improved entry and exit ways also will enable the creation of more ADA-accessible points of egress. To ensure that Penn Station becomes an efficient and gracious entry point to New York City, a broad and ambitious plan for the entire complex must be created. This planning needs to begin now, as Amtrak moves to the Farley Post Office building in 2020. This is just the first of several important steps in coming years that create a new opportunity for finally making Penn Station the world-class facility our City and region deserve. 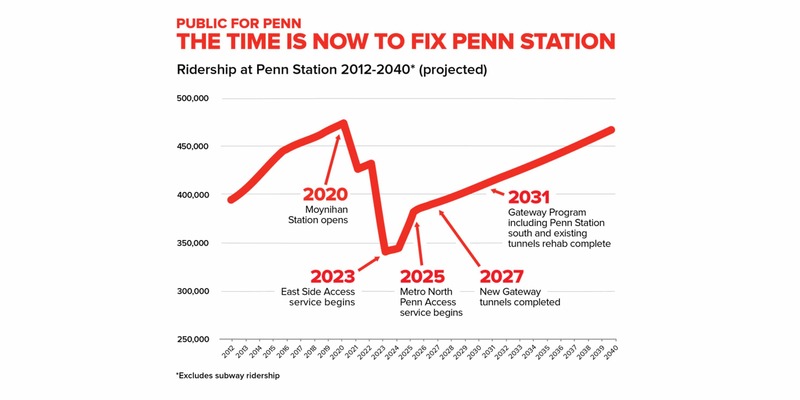 Several upcoming milestones make the timing right to finally address the mess at Penn Station. The opening of Moynihan Train Hall (2020) and the completion of East Side Access (2022) will both temporarily reduce the number of passengers moving through Penn Station, as Amtrak riders will disembark through Moynihan and some LIRR riders will travel to Grand Central instead of Penn. RPA estimates that ridership through Penn Station will temporarily dip by 150,000 once these two projects are complete. The dip in ridership provides a window to make significant improvements to Penn Station, with potentially lower costs and less impact on riders. The expiration of the operating permit for Madison Square Garden in 2023 creates another important milestone and an opportunity to relocate the Garden, which would allow for the creation of a truly world-class transit hub at Penn Station. Elected leaders gave MSG a ten-year permit extension in 2013; now there are five years left for leaders to create feasible plans for moving the Garden to a new home, which would allow for dramatic improvements to Penn Station. This is a short window of opportunity as commuter transit ridership will continue to grow in the decades ahead. The eventual completion of the Gateway Project will also bring two new cross-Hudson tunnels into Manhattan, expanding capacity further and bringing more passengers into Penn Station. RPA estimates that an additional 150,000 commuters from west of the Hudson River will need to be accommodated by 2040, while Metro North plans to connect directly to Penn Station and Amtrak also forecasts increased ridership in coming decades. We need a Penn Station that can handle all these additional trips. To meet these opportunities in this short window of time, there must be a comprehensive plan for the station and its surrounding neighborhood. PUBLIC FOR PENN STATION IS ASKING OUR LEADERS FOR ACTION. Leading transit and civic advocates including Regional Plan Association, the Municipal Art Society of New York, Riders Alliance, Tri-State Transportation Campaign, the Design Trust for Public Space and Transportation Alternatives have joined the Public for Penn Station campaign. This campaign also has the support of key community leaders and elected officials. By combining grassroots knowledge with transit and planning expertise, Public for Penn Station demands that our leaders finally address this public safety issue before it’s too late. This campaign will ensure that commuters’ knowledge and first-hand experiences at Penn Station are shared in a way that leads to real action. WE NEED YOUR VOICE. Visit Public for Penn Station’s online organizing hub to learn more: www.publicforpenn.org. “More people enter Penn Station on a daily basis than the entire population of Portland, Oregon, and Las Vegas. While it’s the nation’s busiest train hall, it’s also crucial that we get a plan for Penn Station that takes into consideration the local neighborhoods and businesses which I represent. I’m grateful to the Regional Plan Association for launching this important commuter advocacy campaign,” said State Senator Brad Hoylman.